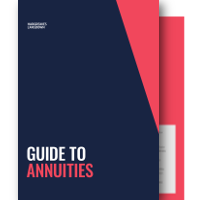 Buying an annuity is still one of the only ways of turning your pension into a secure, guaranteed income for life. This guide is not personal advice. What you do with your pension is an important decision, which could be irreversible. Make sure you understand your options and check they’re suitable for your circumstances. Take appropriate advice or guidance if you’re at all unsure. The government’s free and impartial Pension Wise service can help you. We can offer advice if specifically requested. But before buying one, there are a few things you should consider, such as, how to get the best deal, what happens to your annuity after you're gone and whether you want to protect your income from inflation. These questions will shape the annuity options you choose and determine how much secure income you'll receive.